"The Functional Service Provider (FSP) model remains one of the most popular resourcing solutions. It's a relatively common option. Unfortunately, its key attributes are not well defined," states Wright Avenue Partners CEO and Founder Bill Donovan. In this paper, Bill discusses the importance of finding the right partner, what the partner should deliver and factors that should be part of your buying considerations. Read the full white paper below. 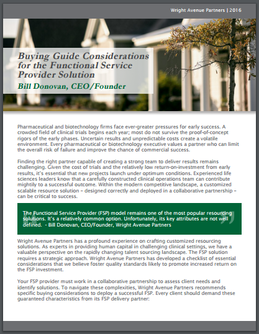 Click here to download Buying Guide Considerations for the Functional Service Provide Solution by Bill Donovan.